Elections 2013 are over in Pakistan and Pakistan Muslim League Nawaz has turned out to be the largest party in the National assembly of Pakistan and also the Punjab assembly which means that Nawaz Sharif will be the next Prime Minister of Pakistan for the third time. On other hand Imran Khan's PTI was able to get 30 seats in National assembly and won in Khyber Pakhtunkhwa Province. During Election campaign we seen many attacks verbal attacks by Imran Khan and Nawaz Sharif on each other specially Imran Khan targeted Nawaz Sharif by taking his name several time. But now the time of election is over and now its time to Form Government and solve the problems of Pakistan like Load Shedding, terrorism and Unemployment. so Imran Khan and Nawaz Sharif should join hands to solve the problems of Pakistan. Yesterday Nawaz Sharif also visited Shaukat Khanum Hospital to meet Imran Khan and presented him roses. 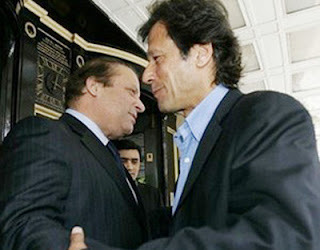 Nawaz Sharif also said that he wants to play a friendly match with Imran Khan now for Pakistan.